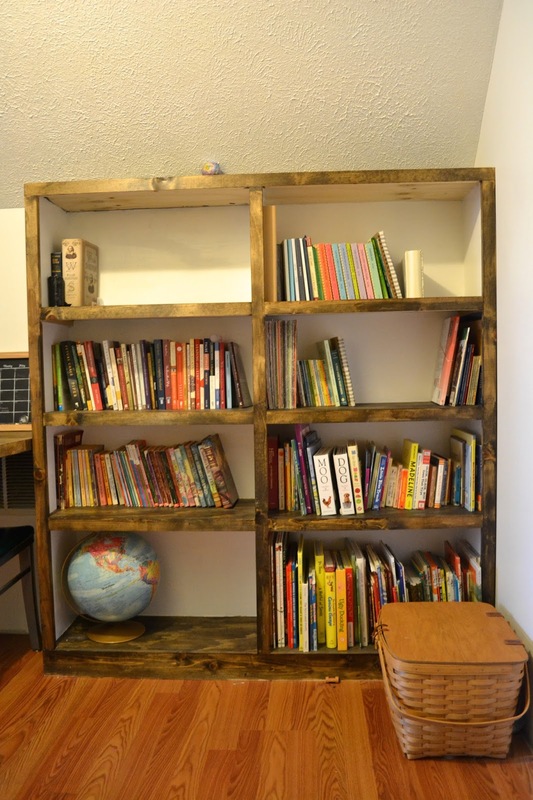 When we bought our house, I didn't plan to homeschool. 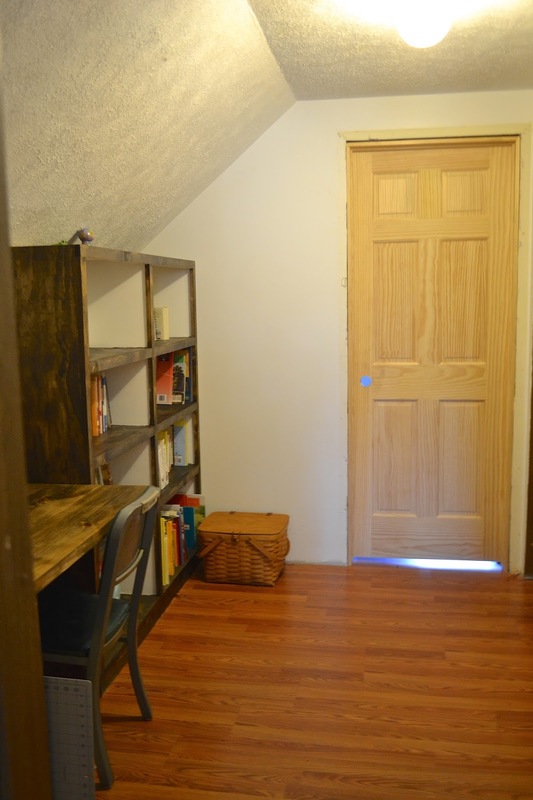 So I wasn't looking at houses and thinking, "Where will our homeschool room be?" But even though I didn't know, God knew. And he provided perfectly for me in this area, as He always does. So we live in a two-story, cape cod house. Incase you're not familiar with cape cods, the second story of these houses has all slanted ceilings. We have two bedrooms upstairs, but then we also have this awkward landing area at the top of the steps that is a space bigger than a hallway but not big enough to make into a room. When we moved in, we discussed what we would do with this area, but we didn't really have any plans. And then God laid homeschooling on my heart. And then it became clear what we would use this space for! So, really, it is not a Homeschool ROOM but more of a Homeschool SPACE. And it is the perfect amount of space. So a couple of months ago, Ben took up the gross carpet and laid down a laminate hardwood floor that had been originally (poorly) laid down in our living room. We put new flooring down there when we re-did our kitchen, but it only made sense to still use this floor since it was in great condition. So we used it to replace the old and dirty carpet in the landing area and playroom. I painted the space white, as well. It was previously an awful yellowed-white. 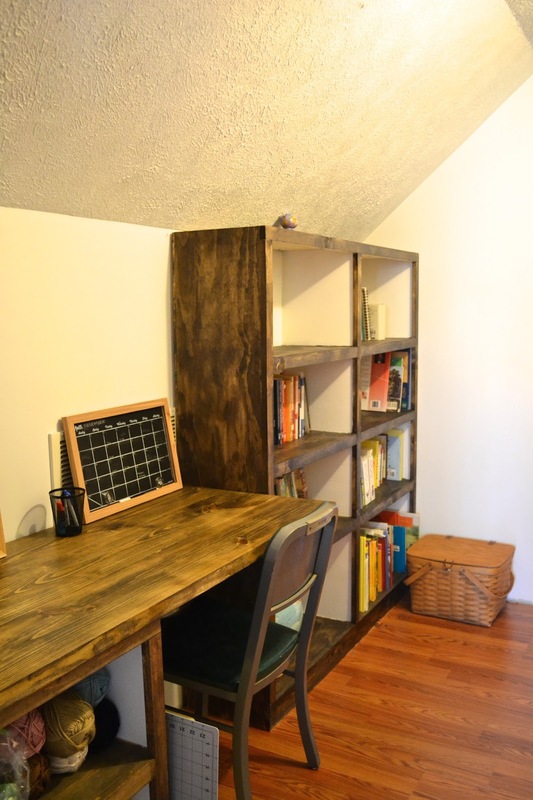 After that, Ben built me a beautiful desk and bookshelf, and I stained and painted them, and now we have a homeschool room! Honestly, there are many things I'd like to do to make this space more "pretty." I have educational wall hangings that I'd like to get, I would like to get wooden crates for the shelving area of the desk so that it looks less cluttered, I'd like a new chair. But for now, with limited funds, this will do, and I am beyond thankful for space to keep all of our school and craft materials and books. That chalkboard will get hung on the wall (instead of sitting on the desk) one day too. The biggest downside to the room is that there is no natural light (it was really hard to capture good pictures). And without spending a fortune, there's no way to add natural light either. I'm a huge fan of natural light, so this is a bummer, but I really don't think we'll actually do our school work in here most of the time. It's mostly just to have a place for all of our school and crafty things. We have been doing our homeschool work all over the place... wherever we feel like it for the day! Usually somewhere comfortable, like a couch, a bed, or on a blanket. Oh, and there's a good look inside our life. Always unfinished rooms and projects :) That door needs finished and it needs a doorknob. At this point, besides finding the time, I'm just undecided as to whether I want to stain the door or paint it, so I'm gladly procrastinating. Maybe one day we'll completely finish this room as I envision it, and I'll post new pictures... and maybe not. And either way, it's okay, because it's a functioning space, and that's what matters more in the end.